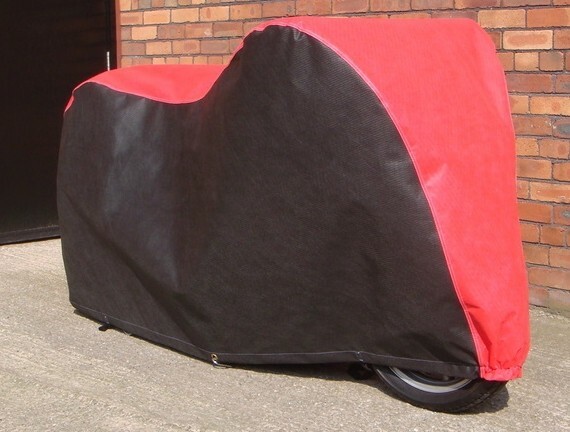 Our TRITECH Kawasaki Motorbike covers are designed to protect bikes from the harmful effects of direct sunlight, dirt, abrasion and damp weather. The triple layer protection allows the cover to breathe whilst remaining 100% waterproof. All covers are semi-tailored and come in a wide range of styles and two-tone colours. The covers have snap buckles, straps and brass eyelets to allow a padlock to secure the cover. We require the following measurements if you have a top box or panniers fitted. WE ONLY REQUIRE MEASUREMENTS IF YOUR BIKE HAS A TOP BOX / PANNIERS FITTED. Simply Select your Kawasaki model below. 4 Week delivery on this cover as it is custom made to order.